Two weeks before the end of summer break Kayla shared a three-page Google doc of writing exercises with me. Yesterday morning Kate showed up at my door at 7:15am, brimming with writing prompts and workshop plans. And yesterday afternoon my writing meeting with two students turned into an impromptu gathering of ten. The odd part is that these aren’t my students. In fact, I haven’t even met the vast majority of these students who show up at my door. But they keep arriving, and the reason is that kids want to write. I know this because for the last two years, I have co-advised my school’s Writer’s Club, a community of students who set aside time each week to explore words, laugh over prompts, and share their writing. When I inherited Writer’s Club last year, I didn’t think the concept was unique to many schools. A teacher established the club before I was even hired, but as I grew to know my members, I realized Writer’s Club served a larger purpose. Students ranging from freshmen to seniors and academics to honors showed up at my door with notebooks. Students who had been writing their entire lives arrived with laptops packed with stories. While many of these students had tried out newspaper club, yearbook, and literary magazines, they told me they had found their niche here among like-minded peers. 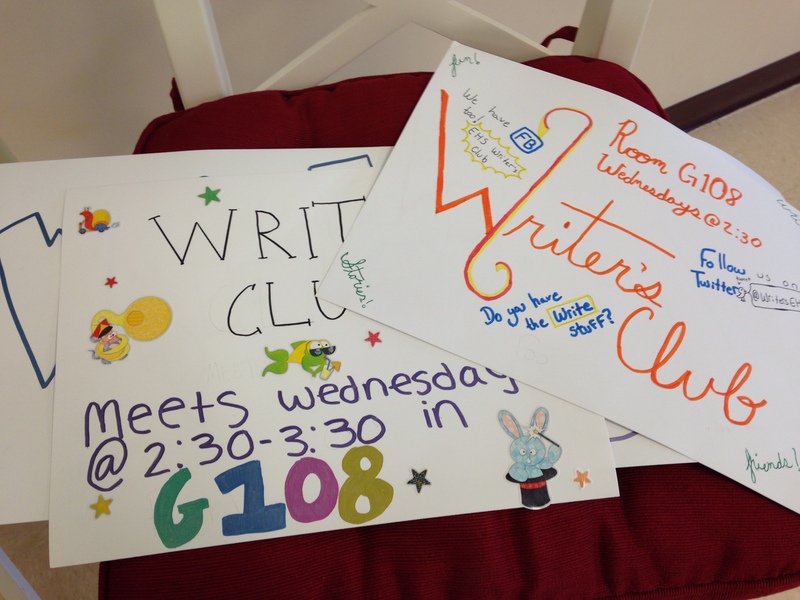 Unlike other clubs that focus on publication, Writer’s Club focuses on the process. This club provides a safe space free from the pressures of classmates, peer groups, and lesson plans. Even my best classes (and believe me I love my classes) don’t capture the pure acceptance and kindness these students have for one another. Just like with adult writer’s groups, these students rely on each other to explore their thoughts and work. Some students carve out time to work on a book they’ve been writing, others plug away at fan fiction, and the majority dabble in a wide variety of styles and genres. This club gives them their fix of creativity that can’t always be reached within the classroom. This year we have a variety of activities lined up. We’re already planning to decorate writer’s notebooks and create a colorful display for the club fair. We’re creating lists of workshop dates so members can sign up and discuss one of their pieces with the group. We’ll have lunch with visiting writers and invite local authors to discuss their craft. As the foliage turns, we’re planning a field trip to downtown Exeter where we’ll take a walking tour then settle into the park with donuts, cider, and notebooks in tow. But above all, we will write and share to our heart’s content. Yesterday afternoon one of my freshmen stumbled into my room to look at the homework board. She froze in the doorway, scanning the room of students who were brainstorming on the white board and sitting at tables painting and coloring club posters. Music was blasting and kids were engrossed in their individual projects, laughing with each other, and telling stories of their summer. “What is this?” she asked me. “It’s Writer’s Club! Want to join?” I said. “Well I’m part of yearbook club. We meet at the same time,” she said. From across the room a student yelled to her, “Cool sweatshirt! I like that” while another struck up a conversation about writing fan fiction on the student’s favorite TV show Supernatural. “Do you want to stay?” I asked. What do you do to inspire writers outside the classroom? Do you have a Writer’s Club or a writing group for us to team up with? We’d love to Skype, e-mail, share, and chat with writers from across the country!